As a chef it is always interesting for me to discover a new ingredient. Cannabis, now legalized in Canada, is no exception. Still, when the initial request for the assignment came in from my editor, I had to laugh. Far from an experienced user, and long having written off edibles (thanks to once snacking on a horrible-tasting, heavily dosed weed cookie), what would I be getting myself into? I got in touch with an expert for some help. Dan Sutton is the owner of Tantalus Labs in Maple Ridge, B.C., where they grow medical-grade cannabis in greenhouses. He is a passionate and experienced user with great insight for beginners. Both Sutton and I agree that the prospect of having an unpleasant experience is one of the biggest turn-offs for anyone thinking of giving edibles a go. The key, according to Sutton, is to “start low and go slow,” and by that he means “very slow,” as the effects of edibles can take up to two hours or more to develop. An initial dose of 3.5-5 milligrams of THC will provide the average adult with a detectable psychoactive response, whereas a confident user with a higher, more confirmed tolerance might begin with a dose of 10 mg and work upward from there. The difference between the two doses may seem small, but the effects of ingesting cannabis are much more impactful than smoking it. 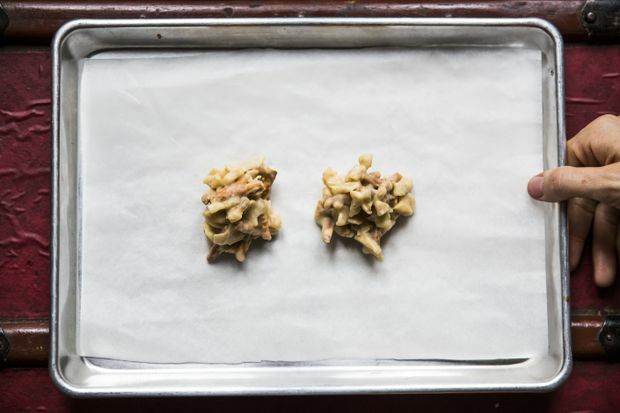 “You don’t need much when it comes to edibles,” Sutton says. The three main factors that will affect the strength of any given edible are potency, decarboxylation and infusion. But before we jump into the kitchen, it is important to acknowledge that cooking with weed is not for everybody. Cannabis is a powerful and potent medicine, and it is recommended that you discuss it with your family doctor before diving in. It most certainly should be kept out of reach of children and pets. Finally, Sutton recommends using legal cannabis purchased through a licensed dealer and certified through the Access to Cannabis for Medical Purposes Regulations. ACMPR-regulated cannabis is lab-tested and has a certified potency percentage, which is also helpful for accurately calculating the intended dosage of any edibles you might be making. Sutton says that doing a little “cannabis math” goes a long way in helping to ensure you achieve accurate potency by volume when cooking with marijuana. As the percentage of THC contained in any given strain of cannabis can range from below 2 per cent to upward of 25 per cent, Sutton suggests cooking with a strain that has a THC content of 10 per cent. Therefore, 1 g of cannabis with a certified content of 10-per-cent THC contains 100 mg of THC. If we were to then infuse this 1 gram of cannabis into 10 tablespoons of oil, we would have 10 servings of cannabis oil with a potency of 10 mg THC per serving. As there are 3 teaspoons in 1 tablespoon, we can therefore assume that a serving of 1 teaspoon would be fairly close to the suggested dose for an average inexperienced user of 3.5 mg THC. Raw, uncured cannabis is non-psychoactive, which means that before cooking with it, the buds first need to go through a process called decarboxylation to become activated. This involves applying steady low heat to the cannabis you intend to cook with to transform the naturally contained, non-psychoactive cannabinoid, THCA, into its potent and euphoric cousin, THC, or tetrahydrocannabinol. The other factor that will affect the potency of your edibles is the length of time cannabis is infused in the edible. For the purposes of this recipe, infusing the decarboxylated cannabis in oil for 1.5 hours will provide consistent results. Please note that the longer you leave the buds in the oil, the stronger your infusion will become. If you are still feeling uneasy about consuming THC-infused food, this same three-step process can be applied to high-cannabidiol, or high-CBD, strains of cannabis as an alternative. Unlike its psychoactive counterpart THC, CBD is said to offer a more relaxing and non-intoxicating experience that also lends itself well to a variety of medicinal uses. Roasting whole cobs on the barbecue is one of my favourite ways to cook corn. Although the potato chips are certainly a cheeky nod to stoner snack culture, the great thing about this recipe is that it can be enjoyed without the cannabis-infused oil if you so choose. This recipe serves 1 as it is intended to make the dosage more comfortable and accurate for beginners. 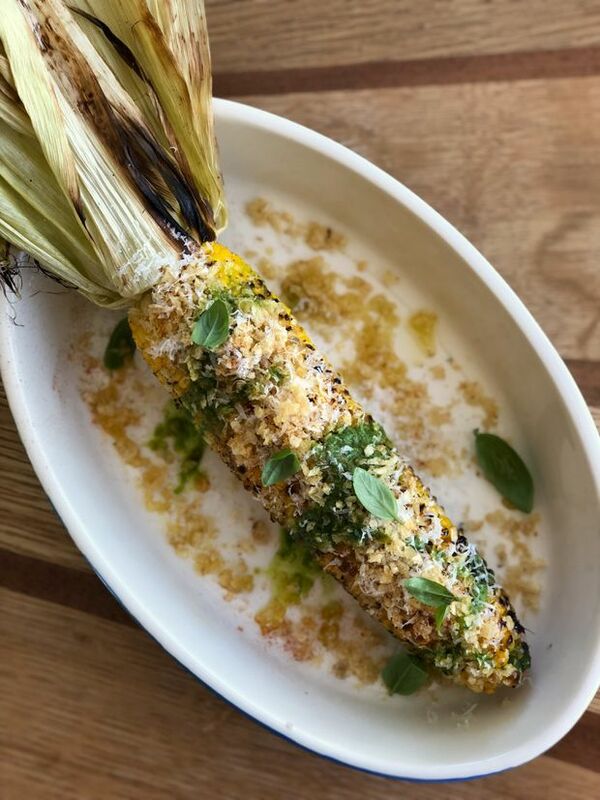 If you intend to make this corn for a crowd, garnish each cob in a separate serving dish so that the doses of THC-infused oil are distributed evenly. Note: This recipe will make more basil oil than you will need for 1 serving, but will keep well in the fridge for up to one week. Preheat the oven to 240 F. Break the cannabis up into smaller chunks using scissors or your hands. Place in a small glass baking dish and cover with foil. Bake in the oven for 45 minutes. Remove the cannabis from the oven and allow to cool. It should be dry and fragrant. Note: Older, drier cannabis may require less time. Add the olive oil, the decarboxylated cannabis, both garlic cloves and rosemary to a small heat-proof glass jar with a lid. Heat a small pot of water to between 160-180 F. Place the sealed jar in the water and allow to infuse for 1.5 hours. Maintain low heat, ideally keeping the water above 160 F but never exceeding 200 F.
Immediately strain the oil through a coffee filter into a clean glass jar. Allow to cool. Clearly label the jar so that it is not mistaken for regular olive oil. Store in a sealed container in the refrigerator. Bring a small pot of well-salted water to a boil. Add the basil and allow to cook for 15 seconds. Strain the basil and rinse under cold water. Gently squeeze to remove any excess liquid and add to a blender with the olive oil. Blend until smooth. Season with salt. Store in a sealed jar in the fridge until ready to use. Preheat a barbecue to medium-high heat. Place the corn on the barbecue and allow to cook with the lid closed for 10 minutes. Open the lid and rotate the cob every 2 minutes to ensure even cooking. Remove from the barbecue and place on a sheet tray. Allow to cool until you are able to handle the cob in your hands. Peel back the husk, keeping it intact so that it becomes a handle of sorts. Brush the corn with the melted butter and season liberally with salt and pepper. Shake off any excess seasoning and place back on the barbecue. Continue to grill for another 10 minutes, again rotating every 2 minutes to ensure even colouring and cooking. Place the grilled corn on the cob in a long, shallow dish. Sprinkle evenly with the Pecorino Romano. Drizzle with the basil oil and the cannabis-infused oil. Finish with the crushed potato chips. Add the basil leaves and a few grinds of fresh cracked black pepper. Enjoy immediately. If using cannabis-infused oil, one serving of one corn on the cob is equal to 3.5 mg THC/CBD. Yogurt-covered pretzels are everything. They are the perfect sweet and salty snack. This recipe takes them to a new level, elaborating on a no-bake haystack cookie technique to make an ultimate treat even better. Super-easy to make, there is no need to even turn on the oven, as these babies set up in the refrigerator. Make them as is with CBD-infused coconut oil, or simply substitute plain, weed-free oil if you so prefer. It’s very easy to double or triple this recipe. Keep in mind, however, that when making larger batches of cannabis-infused edibles, it can be difficult to ensure even distribution of the THC or CBD from one portion to the next. If this is worrisome, don’t fret. Assuming you infuse your oil accordingly, this recipe is designed to yield a total single serving of 3.5 mg CBD. You can feel confident knowing the dosage you choose to consume will be reflected in the final product. For best results, find white chocolate that uses pure cocoa butter and isn’t crammed full of palm oil. Add the coconut oil and the decarboxylated cannabis to a small, heat-proof glass jar with a lid. Heat a small pot of water to between 160-180 F. Place the sealed jar in the water and allow to infuse for 1.5 hours. Maintain low heat, ideally keeping the water above 160 F but never exceeding 200 F.
Immediately strain the oil through a coffee filter into a clean glass jar. Allow to cool. Clearly label the jar so that it is not mistaken for regular coconut oil. Store in a sealed container in the refrigerator. Over a bain-marie, melt the white chocolate, coconut oil and sweetened sesame butter. Stir until smooth and completely warmed through. Stir in a pinch of salt and the yogurt. Immediately add the dry ingredients and stir to combine. Spoon the resulting mixture into two piles on a parchment-lined plate. Place in the refrigerator and allow to cool until set, approximately 30 minutes. Store in an airtight container in the fridge. Will keep for up to one week. If using cannabis-infused oil, one serving of two cookies is equal to 3.5 mg CBD/THC.